Workcoffee, where you can find a job while enjoying a capuccino! 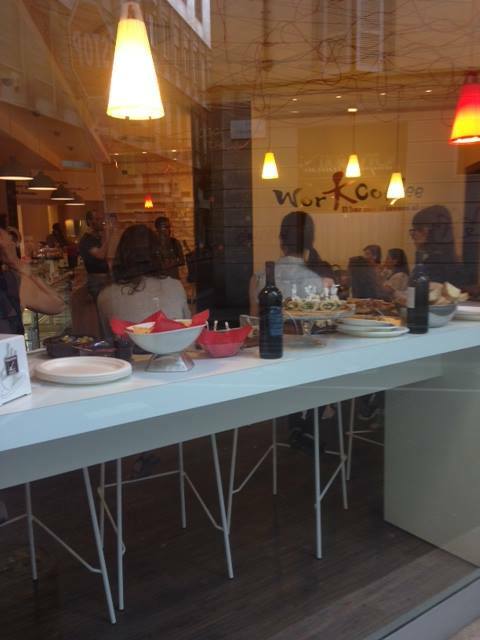 On Wednesday 22nd October, experienced Business English coach Robert Dennis of Riverstone took part in the first English “Language Aperitivo” (Aperitivo in Lingua) at Workcoffee, an innovative meeting place for people looking for work in Milan. With around 20 participants, the event included a presentation by Robert on how to write a CV (curriculum vitae) in English. Following the question and answer session, people at the event enjoyed a discussion in English and a delicious buffet provided by Workcoffee. WorkCoffee is a relaxed, informal location where you can find a wide range of free services to help you in your search for a job. It’s the ideal place to get information and take part in practical activities and events that can help you enhance your skills and give yourself an advantage in the jobs market. It’s a beautiful, modern bar furnished in the style of an American coffee shop, with computer terminals, free wifi and, of course, great coffee! There are also boards where you can post a message about your search for work and read about the positions and opportunities on offer. Workcoffee has a regular and very well organised programme of events including the “aperitivi in lingua” (English and French); presentations by leading employers, including a recent aperitivo with Everis, a multinational consulting firm in the ITC sector, which was well attended and received great feedback. Write your CV in English and Italian: have two separate versions. Make sure there are no spelling mistakes and check your email, phone number and dates, etc. List your previous jobs starting with your last job and then work backwards to your first job. Use the same system for your professional qualifications and educational achievements. Never invent anything but also remember that you don’t need to include every detail about yourself. Be selective and only include job achievements or experiences if they are relevant for the job you are applying for. Check that you are sending the CV to the right department (usually Human Resources) and the right person. Add a covering letter or email (which is something that we will look at in a future session). Feedback from the event has been very positive and Riverstone is looking forward to the next event at Workcoffee, which will focus on job interviews. Many thanks to Giulia at Workcoffee for organising this event and to Alessandra for providing such a great aperitivo – including nachos and dips! Cost: Free to attend. Buy a drink and enjoy the fantastic aperitivo (included)! This entry was posted in Business Networking, Live Events, Riverstone News and tagged aperitivo, applications, business, communications, curriculum, curriculum vitae, CV, CVs, employment, events, jobs, Milano, recruitment, Workcoffee. Bookmark the permalink. ← Riverstone Encounters: a new concept in sharing ideas and networking in English!